INDUSTRY.co.id - Huawei P20 Pro is the first smartphone to use triple camera from Leica, reinforced with Artificial Intelligence (AI) technology to push the limits of creativity from mobile photography. 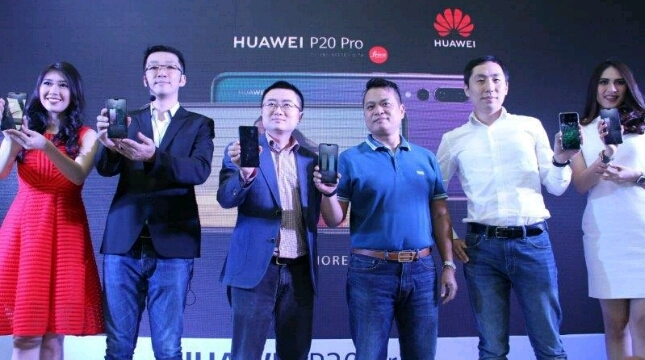 "With an innovative triple camera from Leica, as well as powerful Artificial Intelligence (AI) technology, the Huawei P20 Pro reflects the beauty and passion to record and share the most beautiful and precious moments of your life in the easiest way.Because from now on, anyone can become a photographer, "said Lo Khing Seng, Deputy Country Director of Huawei Device Indonesia, Thursday (28/06/2018). Leica's triple camera feature system generates the highest number of pixels; Photographic features with AI Master driven by Artificial Intelligence (AI) technology and HUAWEI AIS, AI's powerful stabilization technology from Huawei; Less Bezel; Stunning performance with dedicated Kirin 970 and NPU, and EMI 8.1 based on Android ™ 8.1. The camera configuration consists of a 40MP RGB sensor with f / 1.8 apertures equipped with Phase Detection Auto-Focus (PDAF) feature to bring sharpness of the image to every recorded photo. As well as 20MP monochrome sensor with f / 1.6 aperture, and 8MP sensor with telephoto lens and f / 2.4 aperture. The camera in this smartphone is also equipped with the latest 1 / 1.7 type sensor for low light photography or at night. Combined with high sensitivity thanks to ISO that can be tuned to 102400, equivalent to a professional camera. Huawei P20 Pro also comes with the latest lens VARIO-SUMMILUX from Leica with zoom capability aka 3x zoom. This smartphone can also do 5x hybrid zoom and 10x digital zoom. Huawei P20 Pro has a front camera with 24MP sensor and f / 2.0 apertures, also equipped with 3D face modeling technology that is powered by AI technology. Equipped with 3D Portrait Lighting features to produce studio-quality lighting effects. A dedicated Kirin 970 processor and Neural Network Processing Unit (NPU), this smartphone can identify 19 different photo shoot and photo scenarios and comes with predictive 4D focus. The existence of AI-Assisted Composition feature will propose framing on group photos and landscape. Meanwhile, Huawei AIS (AI Image Stabilization) feature, making this smartphone more stable. This feature will help when recording video, which already supports six-axis and slow-motion stabilization, from 120fps to 960fps, to deliver crisp, detailed and super-slow video. "Huawei P20 Pro won the competition in every category, reaching number one in photo and video rankings if you're looking for the best camera in your smartphone, do not look for another," Lo Khing Seng said. In Indonesia, Huawei P20 Pro will come with a Twilight color with gradation effect of color movement based on the direction you see it. This effect makes the back of this smartphone display different colors depending on the direction of the view. Huawei P20 Pro is designed with a very thin bezel and a very attractive screen-to-body ratio. The 6.1-inch OLED display uses a curved 3D glass panel to produce elegant and resilient elements. With an IP67 rating and IEC 60529 certificate, the Huawei P20 Pro proves waterproof and dust. So, doing mobile photography will not be constrained even if it rains. Powered by Kirin 970 chipset and 8.1-based EMUI 8.1 interface, Huawei P20 Pro delivers unmatched performance from calling, gaming, to photography. EMUI 8.1 is fully customizable with AI support, including bringing the Huawei Share 2.0 feature to share files with other Huawei users, PC and Mac devices. As well as an easy projection feature to connect this smartphone wirelessly to a larger screen, simply plug and play the type-C cable to HDMI. This smartphone will act as a touch pad, while the screen moves to a bigger screen. Smart Screen functionality will intelligently display a separate interface to run two apps simultaneously. Huawei P20 Pro comes with Bluetooth connectivity with 990kbps bandwidth to support high-resolution files. Huawei P20 Pro also features HUAWEI SuperCharge TÜV Safety certified and 4000 mAh battery plus Battery Management, which is also powered by AI technology. With Huawei SuperCharge and a large 4000 mAh battery. The sound quality is amplified by Dolby Atmos to produce cinematic sound. Huawei P20 Pro will be available on July 7, 2018 for Rp11.999.000. On July 7-8, Huawei will kick-off the presence of Huawei P20 Pro in Indonesia by engaging exciting activities with customers in Central Park, Jakarta.